If any community in Gulf Breeze can rival all of Florida's most exclusive neighborhoods, Peakes Point is the one that does. 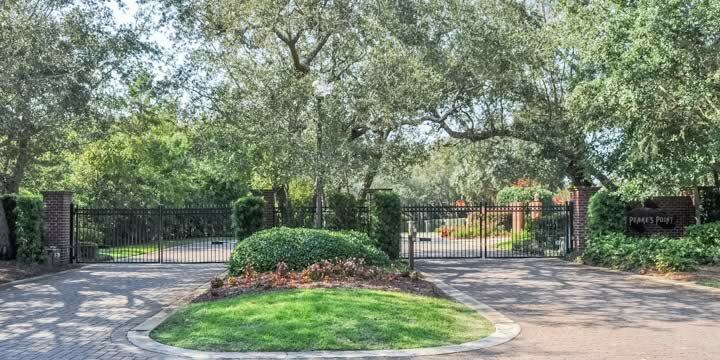 This gated waterfront development sits on the western end of the peninsula, with both the Pensacola Bay and the Santa Rosa Sound on either side. This is as far as you can go in Gulf Breeze, as the water surrounds it on three sides. You get there from Fairpoint Drive, onto Peakes Point Drive. Developed around 2005, the homes in Peakes Point are truly palatial mansions, averaging 6,000 square-feet, with floor to ceiling windows decorating the sprawling Mediterranean masterpieces on a near acre of pristine waterfront and landscaped lots. Of course, every luxury touch has been included, along with beautiful saltwater pools and outdoor entertaining areas. Peakes Point has underground utilities as well. These homes are seldom for sale, and when they are, it is in the $2-3 million dollar price range. You may find a lot still available for around a million, but likely if you have your heart set on this community you will need to get on a waiting list. Of course, the water views are indescribable, the privacy complete, and the lifestyle a paradise. Most homes have a private dock and boat lift on a beach that you will only share with a handful of neighbors. If you are in the market for a one-of-a-kind, private and exclusive waterfront home, call us to see if anything is available and to possibly put you on a list so that you will be the first to know when someone decides to sell. We look forward to showing you this amazing community of homes for sale in Peakes Point.